In reality, it takes a lot more than just high reps of many assorted abdominal moves to develop an envy worth set of six pack abs, or even a flat or moderately toned stomach. We previously elaborated on planks here and here, we introduced the stomach vacuum and presented 66 abs exercises in part1 and part2. When you think of your abs, you envision the six-pack. You imagine the perfectly carved rectus abdominis muscle that’s ever so visible, at least if your body fat is in single digits. Today, we’ll talk about the transverse abdominis. It’s actually located behind the rectus abdominis and isn’t visible — but that doesn’t mean you should skip training it. Training the transverse abdominis can effectively help you develop a better six-pack and even strengthen your core. But first, let’s see how the transverse abdominis works. What Is The Transverse Abdominis? The transverse abdominis (TVA) is the deepest layer of muscle tissue in the abdominal wall, originating from the costal cartilage of the lower six ribs, the anterior portion of the iliac crest (the top part of your hip bone) and the inguinal ligament. It wraps around to the front where it connects to what’s called the xiphoid process (the base of your sternum), pubic tubercle (front of pubic bone), and linea alba (which separates the right and left halves of your six-pack). 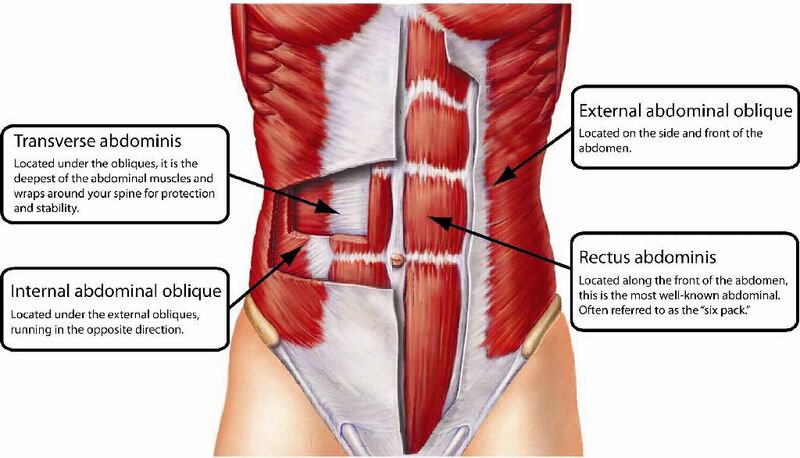 The primary purpose of the often underrated transverse abdominis is to compress the abdomen; the secondary purpose is spinal and core stability. What this essentially means is that without the transverse abdominis, you wouldn’t be able to hold your stomach in – it would appear distended. In layman’s terms, you’d be rocking a beer belly. We wrote previously about the “vacuum pose” that was popularized by one of Arnold Schwarzenegger’s bodybuilding rivals, Frank Zane. The exercise utilizes one’s ability to contract the transverse abdominis (sucking in your stomach). This is ideal as you simultaneously contract (or flex) the transverse abdominis at the same time as the rectus abdominis to create a bit more of a dramatic look to the abs overall. By training the TVA, you’re essentially building up your endurance at holding your stomach in, which is something that can be quite difficult to do over longer periods of time, like standing on stage or posing for a photo shoot. And of course it helps when you want to look your best at the beach! Performing a stomach vacuum in the plank position forces your abdominals to work against gravity, further strengthening the transverse abdominis. Because of muscle-fiber make-up, strengthening the transverse abdominis is more oriented toward endurance-style training. Based off the mechanics of the muscle, most of the strengthening of the TVA comes from compound movements that require full core and lower-back stabilization—think squats and deadlifts. A stronger TVA acts as nature’s weight belt, stabilizing the spine and pelvis during lifting motions. Doing specific rectus-abdominis movements like crunches and hanging leg raises alone does have some indirect effect strengthening the TVA, but they’re not enough to pull your belly in. By doing specific exercises to strengthen the TVA you are improving your vacuum while helping to reduce abdominal protrusion, not to mention the positive effect that may have on your lower back. When performing these movements, focus on the compression of the abdomen. Since that’s the natural function of the TVA, it’s important to focus on emphasizing the compression of your abdomen in order to maximally tax the TVA and increase its strength. It may be difficult at first, but after a few times through, you’ll be able to draw in your abdomen and perform a solid vacuum. Perform 2 sets of 12 repetitions with a 3-second hold in the vacuum position on each rep. The plank vacuum is essentially the same motion as a traditional vacuum, except you’re in a plank position on the floor. You’ll follow the same protocol as above, but being prone forces you to work directly against gravity, thus making it a more advanced variation. Place your shins on an exercise ball with your hands on the floor. Roll the ball toward your chest by driving your knees into your chest, flexing your abs in the process. Ordinarily, this would just be a normal exercise for the lower rectus abdominis, but if you simultaneously focus on drawing in your gut and performing a subtle vacuum at the end of the movement (when the legs are extended), you’ll notice a much stronger engagement of the abs. This is a great introduction to how improving the TVA can begin to help you train your rectus abdominis (the six-pack) more effectively. It is recommended to train the transverse abdominis three times per week. Do it after your weight workouts, when you’re already slightly fatigued. Remember, this does not replace your normal ab training; it should be an ancillary set of exercises that’ll enhance your six-pack like never before! For more on abs, visit our recommendations for the top 10 abdominal exercises without using equipment, the top 10 abdominal exercises using equipment and the top 10 yoga exercises for your abs. Enjoy!